Yes, folks, cardiovascular disease can be reversed and - surprise, surprise - with the use of nutritional supplements! The Most Effective Therapy for Reversing PlaqueJames Roberts MD is a cardiologist, lecturer and author who has written extensively on his experience using a nutritional supplement which is capable of reversing heart disease. The name is Essential Phospholipids with EDTA. The two products he mentions are DeToxMax and LipoPhos EDTA . Phosphatidylcholine Therapy (PC) - is the most effective therapy in the anti-atherosclerotic armamentarium. The PC molecule improves cell membrane function, increasing absorption of oxygen and nutrition at the cellular level. 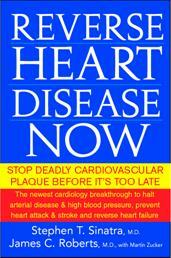 Left Image: Book Cover, courtesy of James S Roberts MD and Steven Sinatra MD, Reverse Heart Disease Now: Stop Deadly Cardiovascular Plaque Before It's Too Late. PC Stimulates Reverse Cholesterol Transport PC stimulates the HDL-associated enzymes of reverse cholesterol transport, promoting the removal of excess cholesterol from our cells, including the endothelial cells that line our arteries. PC has been shown to improve blood flow and reduce symptoms in humans with narrowed arteries, and to anatomically reverse atherosclerotic narrowings in animals and in humans.